Yes, this may seem a strange time to quote the ill-fated Soviet leader Leon Trotsky, of all people. But the phrase attributed to him, "You may not be interested in war, but war is interested in you", does seem to be a fit right now. Few, if any, of us - north or south - want to return to the dreary and lethal days of Irish Border checks. But, as the continual brinkmanship is ramped up, if the Brexit cards fall a certain way, we're going back to the Border. Even in such a grim eventuality, we should recall a central fact: the EU did away with the Irish Border - not the IRA, nor the irredentist nationalistic rhetoric from people like Éamon de Valera. The 1992 EU single market removed those ugly botháns and containers, hosting tedious hours of customs form-filling. In fact, Brussels quietly drove home the changes with generous peace grants, given with minimal asking since the summer of 1994. Return to the Border would be a double tragedy - turning back the clock. Sources in Brussels yesterday told this writer that Ireland-EU talks on the Irish Border if no-deal happens must be stepped up. "Discussions on this between Ireland and the Commission will intensify," the source said. Experienced Brussels diplomats see the EU's admission yesterday that a no-deal, crash-out Brexit was "increasingly likely" on April 12, as again "upping the ante" in the Brexit war of nerves. "There remains a belief that the UK will pull back from the brink because they know the extensive harm a no-deal exit would bring themselves," one senior official said. But the Brussels diplomat conceded that the need for Irish Border controls would "become very real" in the case of a no-deal Brexit. Efforts continue to find a way to prevent the return of checkpoints dotted between Dundalk and Derry. There can be checks at point of manufacture, or processing in the case of food, and using 'trusted trader schemes' to reduce trade disruption. Even in a worst-case scenario, no real EU action will happen on the Irish Border for several months. But there is a strong EU view that UK temporary tariff arrangements are illegal under World Trade Organisation rules and promote smuggling. The Irish Government was badly jolted on January 23 last when the EU Commission chief spokesman, pushed to give the EU position on a no-deal scenario, conceded that it would mean "a hard Border". 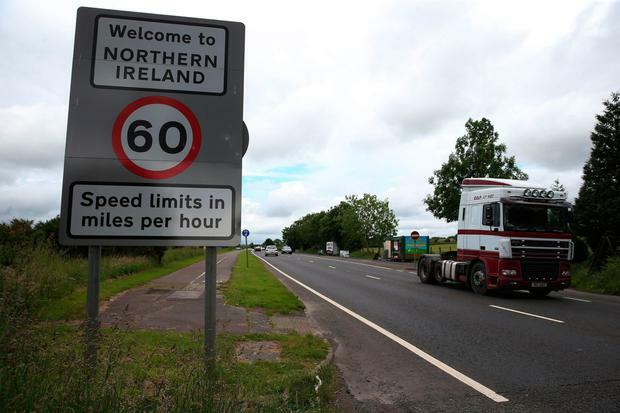 Margaritis Schinas said: "If you'd like...to push me and speculate on what might happen in a no-deal scenario in Ireland, I think it's pretty obvious - you will have a hard Border." But he also stressed that the EU would be trying at all times to honour the 1998 Good Friday Agreement and later sought to soften his message. The official response in Dublin was a swift rejection. We are not interested in a Border - but that of itself will not stop it.